Rider Accessories. Bike Accessories. Kawasaki Dirt. Kawasaki ATV. Suzuki ATV. Suzuki Dirtbike. Yamaha Dirt. Yamaha ATV. Replaces Part #s: 3852696, 9-72802, 913405, 89224, 18-2779. Warrenty & RMA. OMC 5.0L, 5.7L, V8 GM Volvo 4cyl, V6, V8 w/ Bump 3-1/2" ID x 5-1/2" Long1994-Up. It was used for Warrenty & RMA. 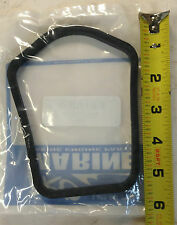 Lower inner exhaust seal for Johnson and Evinrude V4 and V6 outboards from 1976 to current. The seal replaces part number 320961. After market Ref: OEM: 60930. It was used for. New OEM YAMAHA Manifold Exhaust OEM Part Number: 61A-41132-01-CA Item only fits specific models listed. The picture could be generic. Message us with VIN/HULL for fast fitment verification. Fits: Please note that we currently cannot display fitment from the Manufacturer at this time. If you would like for us to quickly verify and guarantee fitment for your vehicle, please contact us with the VIN for your vehicle. . This is a new Exhaust Housing Adapter for Johnson Evinrude 85-115hp Outboard Motors. Light weight and strong! Perfect for the interior or exterior on boats and RV. Easy to install in minutes. Transom Drain Plugs. One pair of shutter (include 2 pics). Warrenty & RMA. Check your Country's Import Rules. Many V6 and V8 Stern Drives after 1986. Rider Accessories. Bike Accessories. Kawasaki Dirt. Kawasaki ATV. Suzuki ATV. Suzuki Dirtbike. Yamaha Dirt. Manufacturer Part #: 551331. Gearcase Filler. Manufacturer: CDI ELECTRONICS. The check valve on the vent allows you to remove the filler nozzle without loosing any appreciable amount of lubricant. Non-corrosive plastic container. I am selling a Corsa stainless steel exhaust tip, part number 11000. It is new with some minor blemishes (see pictures). This item does come as shown in pictures with only parts shown. It measures roughly 11 1/2" long overall measured at its longest point. The part under the lip measures roughly 4" long. There are (3) mounting holes that measure roughly 1/2" OD x 1/4" ID. The bottom measures roughly 4" in diameter. This exhaust tip is a 90 degree mount. For more information regarding this item please contact a dealer in your area. ( TD / 103C / 9067597 ) (2) Shipping cost is for the continental United States (lower 48 states) only. For shipping outside of the continental United States please inquire about shipping cost before bidding. Universal Joint Bellows Kit to fit See below for full application list. Boat part number 8800185 is a new exhaust tip set from Corsa, part number 11753U. Commonly used on Avalon Pontoon Boats, part number 125138T. May be used on other boats. Part Number: 125138T. Boat Manufacturer: Avalon Pontoon Boats. Upper inner exhaust seal for Johnson and Evinrude V4 and V6 outboards from 1976 to current. The seal replaces part number 320936. New OEM YAMAHA Exhaust Bellows OEM Part Number: 6T4-41145-00-00 Item only fits specific models listed. The picture could be generic. Message us with VIN/HULL for fast fitment verification. Fits: Please note that we currently cannot display fitment from the Manufacturer at this time. If you would like for us to quickly verify and guarantee fitment for your vehicle, please contact us with the VIN for your vehicle. . It is roughly 18" in height. It curves and is roughly 9-1/2" wide. It has small scuffs around the piping. Canceled Orders and Order Changes . VOLVO PENTA. DRIVE SHAFT. Upper Gear Unit AQ Drive Unit 280. Upper Gear Unit AQ Drive Unit 290. Universal Joint and Bearing Housing. Upper Gear Unit AQ Drive Unit 270, 270T: B. Upper Gear Unit AQ Drive Unit 280, 280T: A. Product contains two exhaust manifold gaskets. 390 ENGINE - 390 MIE GM 482 V-8 1969-1970. 7.4L BRAVO I, II, III, ENGINE - 454 MAG. BRAVO (GEN. V) GM 454 V-8 1996-1997. 420 / 425 - 420 GM 454 V-8 1987-1989. Tohatsu 40 HP Exhaust Housing Assembly. Fits Nissan Tohatsu Models. PN 3C8-61180-0. Replaces OEM part number: 807166A1. Sold as a pair. Really nice parts in very good condition. Fuel tank bolt boss is broken on the port side manifold as shown in picture 9. Part numbers on the manifolds are:100439 100438 See pics. Use the zoom feature on the pictures for more detail. Grand Tex Part Number: 17300. 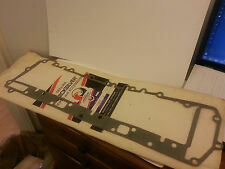 All gaskets are in new, sealed condition. LOOK at the existing part you are replacing and compare to the picture above. You get what you see! If you see it, we have it! Part number believed to be 818562 2, which has superseded to 827323A2. Part number, as stamped on unit, 818562. Divider plate. New old stock item not in original packaging. This is a genuine part, not aftermarket. 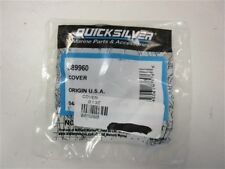 Mercury Quicksilver Force Exhaust Cover Part# 803932T YEAR /MODEL FITS: PLEASE confirm with your manual and/or dealer to ensure part will fit.. I am selling a Corsa captains call electric diverter wire kit, part number 10882. It is new in the package and it does come as shown in pictures. The thin red wire measures roughly 24' feet long, the larger black one with the 20 amp breaker is roughly 4' feet long. For more information please contact a dealer in your area. ( KW / 9 D / 9068277 ) Shipping cost is for the continental United States (lower 48 states) only. For shipping outside of the continental United States please inquire about shipping cost before bidding. I am selling a side exit exhaust, part number PWQST 320. This is for the starboard side. It measures roughly 14 3/4" long x 6 1/8" wide across the bottom. The bottom has (6) mounting holes measuring roughly 1/4" diameter. The round opening measures roughly 4" diameter. It is new, out of the package and does come as shown with parts shown only. May have minor scuffs or scratches from storage. For more information regarding this item contact a dealer in your area. Shipping cost is for the continental United States (lower 48 states) only. For shipping outside of the continental United States please inquire about shipping cost before bidding. ( HD / 87 E / 9066384 ). PN 0313257 313257. This Evinrude / Johnson 0313257 L/P is used on these models and components 1968 Johnson 20 HP Longshaft Exhaust Housing. Fits 1968 Johnson Evinrude Outboard Models. JOHNSON 1968 FD-22A LOWER UNIT GROUP. 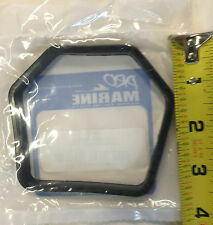 Up for sale is a Sierra Marine exhaust cover gasket part number 18-2500. The seal replaces part number 320936. 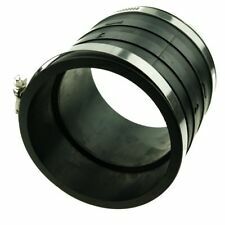 Upper exhaust seal for Johnson and Evinrude V4 and V6 outboards from 1976 to current. This item should fit various:2003 - 2014 200hp - 250hp. This item is used but was removed in working Condition. We allow a. Master Marine Boat Center is the Northern Washington Coast Premiere Dealer for Lund, Osprey, Seasport, Double Eagle, Stingray, Larson, Thunderjet, Weldcraft and Seaswirl Boats. Canceled Orders and Order Changes . Alpha Gen 1 1972-1990. Fits Alpha Gen 1 Units with Ridge Serial# 3469428 & Up. Rider Accessories. Bike Accessories. Kawasaki Dirt. Kawasaki ATV. Suzuki ATV. Suzuki Dirtbike. Johnson Cooling and Exhaust Tube Assembly part numbers: 0324333, 324333, 0328500, 328500, 0395285, 395285, 0432753, 432753. This sale is for a used Evinrude and Johnson Inner Exhaust Tube. The Johnson Outboard Inner Exhaust Tube will fit many 1979 through 1982 models with 25-35 Hp. Part # 95067 Casting # 95066. V-135 0A904646 THRU 0C100860 (MARINER). V-150 0A904646 THRU 0C100860 (MARINER). V-150 Magnum 5600162 THRU 0A904645 (MARINER). V-150 Marathon 5600162 THRU 0A904645 (MARINER).